The theme for the Russian and India armies is urban warfare, as both countries look to be prepared for potential terror attacks in their major cities. The army wing of the Indra exercises will begin today in Russia's southern Volgograd Region, the Southern Military District's press service said. The anti-terror drills, which will focus on urban warfare, will continue till October 2 at the Prudboy training range. A ‘residential’ district was constructed on a training ground in for the joint exercises. The ground, with moving vehicles of ‘the enemy’ and mobile targets of ‘terrorists,’ will be used to train troops to fight under simulated urban conditions. The troops will have to strike about 300 targets, 100 of which will be mobile. In addition, participants of the exercise will have to destroy bandit groups in a wooded area, work out tactics in rear areas and organize ambushes and observation posts. “At one of the stages of the exercise the units will conduct an operation to destroy an ‘enemy’ in a specially-built district of three streets and 50 buildings, with 16 moving targets – UAZ vehicles and about 30 moving figures simulating armed groups inside the buildings placed on the territory,” the statement said. Indra is a joint military exercise conducted by India and Russia that began in 2003. The exercise is tasked with boosting cooperation and interoperability between the Russian and Indian navies. It was later extended to the armies as well. Last month, the air forces of the countries held their first joint exercises. Aerial manoeuvres were held in Voronezh at the Pogonovo range and in Astrakhan Region at the Ashuluk training range. 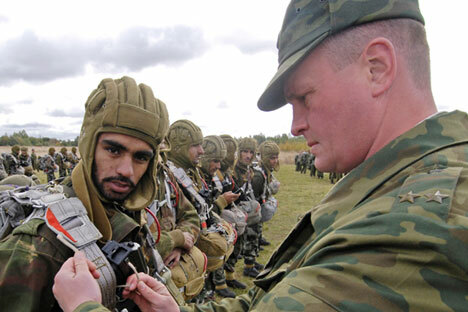 Last year the Russia and Indian armies held the Indra exercises in the Thar Desert in Rajasthan. A joint command carried out an anti-terrorist operation, involving the destruction of illegal armed formations. Russian troops used Indian military equipment, including the T-72 and BMP-2, which were made ​​in Russia. Military cooperation is set to rise between Russia and India and the countries have also pondered over the possibility of including other members of BRICS in joint exercises, although the grouping denies any plans of a military alliance. The Indo-Russian supersonic missile BrahMos is being seen as a model project for joint production with BRICS.